Click On The Website Links to See MUCH, MUCH more. 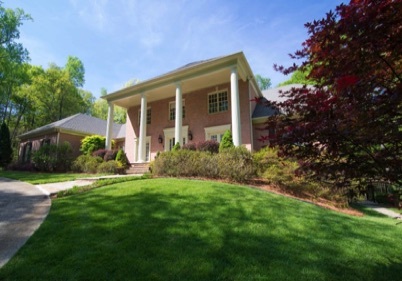 $2,900,000 - 66 Acre Equestrian Estate with Luxurious 11,000 sf home perfectly placed on one of the highest hills in Jasper, Georgia for that panoramic 360° view. Ranch has a 4.5 acre pond and approximately 4 miles of fencing. 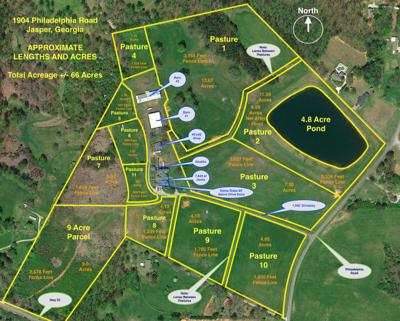 There are 11 pastures and a 9 acre parcel that could be another large home site. The two barns have 24 stalls and studio apartment. Also has large equipment shed and a 40' x 40' shop. The home has huge master on main and a fully finished terrace level with magnificant stone fireplaces. Also offered at $1,900,000 with all structures and 5 Acres. www.JasperJewel.com - Branded with all square footage. www.JasperJewel.info - UnBranded for agents to link to Buyers. 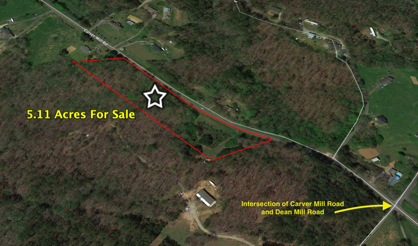 $1,195,000 - 18+ Acres - perfect for a builder of homes. Generally speaking, homes shall be on 1 acre minimum, setbacks are 25' on sides and 50' on rear. No public sewer. 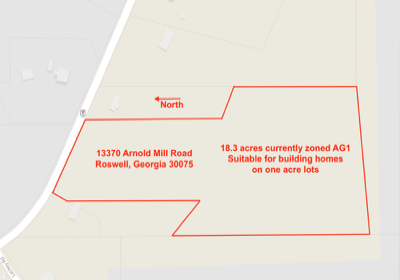 Although it has a Roswell address, Milton controls the zoning - currently AG1. www.Acres18.com - Branded with all square footage. www.Acres18.info - UnBranded for agents to link to Buyers. 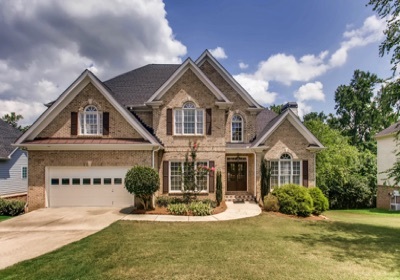 $375,000 - A freshly renovated home in a swim / tennis community about 5 minutes from the Mall of Georgia. Seller has spent about $65,000 on the home so that the new owner doesn't have to. Renovations include a new roof, new deck (buyer can pick color), new carpet, new paint, refinished hardwoods, new "top load" microwave, new light fixtures and other hardware. The two HVAC's are only about 3 years old. It will be the cleanest home you see as it just had a professional "deep cleaning" that even included all windows - outside and inside. Vacant and ready for a quick closing. www.3565rollingcreek.com - Branded with all square footage. www.3565rollingcreek.info - UnBranded for agents to link to Buyers. Pickens County says that there could be 3 homes buile on the property with a minimum of 1 1/2 acres per home. www.Acres5.com - Branded with all square footage. www.Acres5.info - UnBranded for agents to link to Buyers. $1,000,000 - This luxury home features a large Master-on-Main AND another Master upstairs plus luxurious terrace level space with a custom bar and family / recreation room. It is immaculately finished - ready to move in. It even has a porcelain tiled 3 car side entry garage. Enjoy beautiful sunsets beside your outdoor fireplace and back patio while you look out over the park. The home is up a long 500+ foot driveway and is nestled in the woods with your back yard being the 110 acre Leita Thompson Memorial Park and it's 2.8 miles of walking trails. www.Quiet-Acres.com - Branded with all square footage. www.QuietAcres.info - UnBranded for agents to link to Buyers. Private Setting with a 110 Acre "Back Yard"